Bandipur National Park is one more miracle originated from the confluence of the Western Ghats and Nilgiri Hills in peninsular south Indian state of Karnataka. 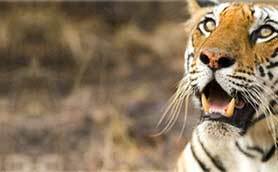 Bandipur national park is one of the best national parks of India and is known world wide for having rich and beautiful flora and fauna. Sprawling over an area of 874 sq km, Bandipur National Park has around 70 tigers and large herd of Asian elephants. The park is embroidered by Kabini rivers and many small brooks that sneak throughout the park and Nilgiri Mountains and their cloud-covered peaks give a fascinating look to the park. This ideal environment led to be ranked as a well-managed Tiger Reserve of India. Best Time : March July , November to October. The western part of the park is covered with tropical moist mixed deciduous forests which feature extensive stands of bamboo. The middle part is not much fertile and comprises tropical dry deciduous forests with low rate of rain. The eastern part is dominated by scrub, characterized by stunted tree growth in areas of shallow hard soil with almost no humus. You will find plants like teak, honne, tadasalu, mathi, nandi, rosewood, sandalwood, bamboo, nelli, kooli, kadu tega and dindalu. 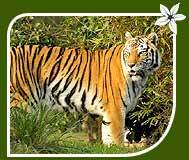 The park is originally known for recording the increment in the breeding of tigers- from 58 in 1991 to 75 in 1997. Most of the tourists come to see our 'King of Jungle'. Other commonly seen animals in the park include leopard, wild dog, jungle cat and sloth bear, striped hyena, jackal, Indian elephant, mouse deer, Indian muntjac, spotted deer, sambar, four-horned antelope, gaur, wild boar, Indian porcupine Indian hare, langur and bonnet macaque. Bandipur National Park has more than 230 species of birds including many endemic ones. The famous ones include the serpent eagles, shaheen falcons, crested hawk eagles, ospreys, gray headed firhings, honey buzzards, Malabar pied hornbills, stork, egret, kite, peafowl, lapwing, sandpiper, drongo and the warbler, hill mynas, king vultures, Malabar trogon, gray partridges, black woodpeckers, Indian pittas paradise flycatchers, cormorants, teals, ducks, herons etc. Among the reptile, the park has marsh crocodiles, monitor lizards, rock pythons, russel's vipers, cobras, rat snakes, wolf snakes, Indian python, vine snakes, common kraits, green keelbacks, bamboo pit vipers, turtles, flying lizards etc. Gundulpet (20 km) is the nearest town from the park and you need it for all communication purpose. 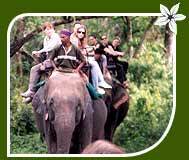 Elephant safari is the most interesting way to explore the flora in the jungle. Safe and full with excitement, this safari will bring you a lot of adventure and excitement. 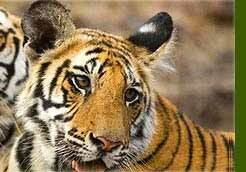 Bandipur National Park is attached with other parks like Mudumalai National Park, Nagarahole National park and others. Make a non-stop visit to this Nilgiri Biosphere Reserve. 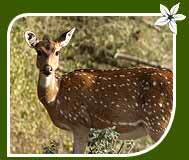 Bandipur National Park is located on Mysore-Ootacamund (Ooty) highway and is well connected by road to all important cities of the state and other south Indian cities. If you go by bus from Mysore, it will take around 3 hours to reach. Mysore (65 km) is also the nearest railhead with regular services to all important cities of south India. Bangalore (204 km) is the capital city of Karnataka state and offers national and international flights. The forest department has arranged some lodges, rest houses and cottages on reasonable price. Some other deluxe resorts and bungalows are also available near the Park. Lodges and deluxe resorts require booking in advance.